We’ve all been there - getting so into the music that we start moving and gesticulating in time with what’s playing. Normally we’d call it “dancing” - and it’s usually following the rhythm and sound of the music. But what if it went the other way and the music was controlled by the movement. For Moscow-based musician Anton Sergeev aka Anton Maskeliade, gesture control forms the basis of a unique live show. 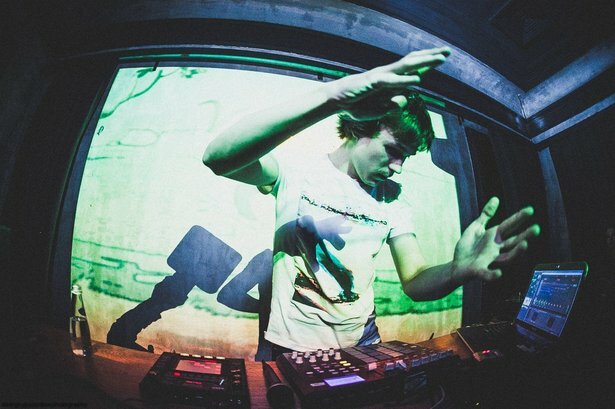 Using the LEAP Motion controller and Ableton Live, Anton uses hand gestures to control his music. We spoke to Anton about working with the LEAP. Anton performs with the LEAP Motion. How did you first come across LEAP? What does LEAP allow you to do that you can’t accomplish with other controllers? I read music blogs, and once I saw a gesture technology device I realized that this was what I needed. I bought the LEAP Motion in November 2013; it was an amazing feeling, expanding my capabilities of music expression. First, I used it to manipulate sounds, then - visuals. Now, I control both music and video projection with my hands. I am able to augment the expressive musical possibilities of gestures and overall body movement. Musical experience, like all experience, entails not just one sense, but all of the body's senses combined and orientated in highly specific ways. For this reason, I think a direct physical relationship to music is becoming an increasingly important area of creative as well as academic study. Can you describe what you're doing with LEAP and how you have it set up? In my gigs I’m using LEAP Motion with the GECO app, along with an Akai MPD32 MIDI controller, Korg Kaoss Pad 3 sampler, Ableton Live, Resolume for visuals. My setup allows me to control video and audio streams simultaneously and synchronized. Working with LEAP and Resolume, I put a special video effect on each gesture and synchronized it with audio effects in Live. In Live, I’m using various effects, mainly the Live’s Reverb, delays, and distortions, along with some other VSTs. Each gesture makes a unique noise or sound effect and a unique projection. The Kaoss Pad helps me to loop my voice and grind some beat-boxing stuff out live. Anton goes mobile - playing in the back seat of a car. What do you think gesture control adds to your sound? Typically, an electronic music gig features a phlegmatic guy hiding himself from the audience behind a laptop and rolling faders. Actually, it’s boring - I don’t like it. I want to put on a show! I like to expand the methods of creation. I live a life during my gigs. And I can feel myself as a wizard. It’s an unbelievable feeling, to materialize music. LEAP Motion helps me to make it real.